“Go West./ Paradise is there./ You’ll have all that you can eat/ of milk and honey over there.” So begins Natalie Merchant‘s song “San Andreas Fault,” which describes a young ingénue’s flight westward to California in search of fortune and fame. "Wyoming" by Floris Van Cauwelaert. Used with permission. All rights reserved. Of course, the notion of “going west” to find a paradise of riches–gold; resource-rich, unclaimed land; escape from religious or other persecution–has long occupied the American imagination, and it is an enduring motif in American arts, letters, and media. In fact, I’d venture to say that this landscape still looms large in our contemporary cultural psyche. At least, I know it does for me: as an “East Coast girl living in a Midwestern world,” I’m fascinated by all points west of the Mississippi River. Many representations of the western United States during the nineteenth century reflect similar contradictions. In contemporary and historical texts, this landscape often emerges as a mirage: White and immigrant settlers go west in search of arable, unclaimed land. If they survive the journey, they encounter conditions much different than what they had imagined. The soil perhaps is unyielding and winters are harsh and long. Moreover, the land is occupied not simply by indigenous people, but also by sovereign nations who hold rightful claims on the territory and its resources. In some texts, the notion that the American West is a mirage–a false Eden or promised land–is not recognized by the emigrant figures in the work or the author. So why this sudden interest in cultural assumptions about the American West and their expressions in contemporary and historical media? Well, I’m headed westward myself. In a few weeks, I’ll travel to Jackson Hole, Wyoming to backpack the Teton Crest Trail in Grand Tetons National Park. I’m really looking forward to the trip, particularly because I’ll be backpacking with some friends I met while traversing the Weminuche last year. 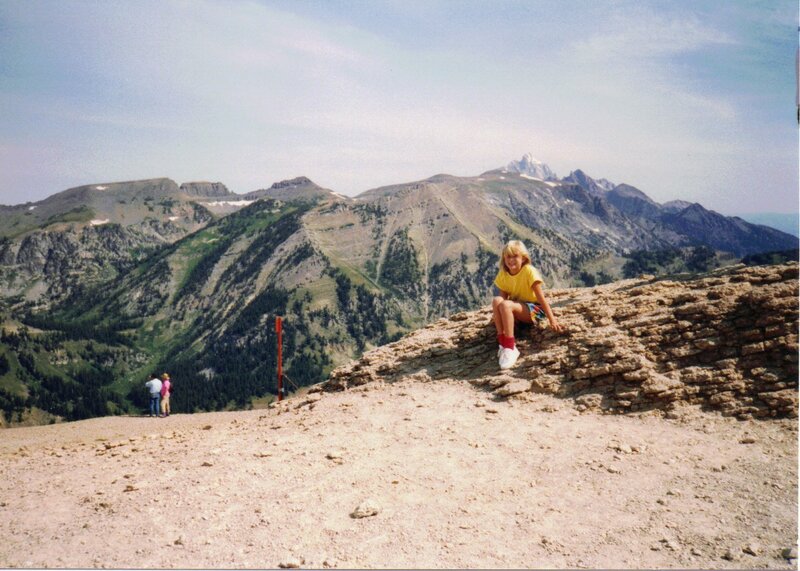 Interestingly, my adventure to the Grand Tetons marks an important moment in my life. My very first journey west was in 1989 (see the photo below). Destination: Jackson Hole, the Tetons, and Yellowstone National Park (and some stops in Idaho and Montana, too). I remember being completely enthralled by the landscape. The mountains were immense, and the landscape not only was majestic, but it also was delightfully foreign and unlike anything I had ever experienced. I felt as if I had been transported to a different world, and in many ways, this was true: I had grown up on a coastal plain, and before my Wyoming/Idaho/Montana vacation, the only peaks I had seen were the rounder, greener, and humbler Blue Ridge Mountains in Virginia. the first film [he’s] seen that evokes what must have been the reality of wagon trains to the West. They were grueling, dirty, thirsty, burning and freezing ordeals. Notably, Michelle Williams and Will Patton star. I was particularly interested in the film because I saw Reichardt’s Wendy and Lucy (2008), and it also features Williams and Patton. Finally, in another happenstance encounter with “the West” (serendipity seems to be a reoccurring theme on this blog), I finally cleaned up my Netflix queue. I’ll be canceling my “Streaming + 1 DVD at a time” plan in September when Netflix raises their prices (and yes, I’m outraged!). In the meantime, I decided to request postal delivery of media titles that I can’t get through Netflix or Amazon streaming. As a result, only a few DVDs now remain in my Netflix lineup, and guess what assumed the #1 and #2 positions? PBS’s Frontier House (2002), which showcases real individuals living as if they were settlers in 1890s Montana. Keep checking back for updates to my “Go West” series. If all goes as planned, I’ll have a few posts about my backpacking adventure in the Grand Tetons to add, as well. The author posing near the summit of the Rendezvous Mountain tram in Jackson Hole. 1989. All rights reserved. Sounds like fun! I will be flying to Wyoming to save time. Most of my road-tripping involves heading towards the eastern United States, but a few years ago, I drove with a group to Utah’s Canyonlands (mentioned in the post) from Indiana. That was an interesting drive! I had never been to any of the “Great Plains” states (got to see Kansas, for instance), and it was fun to drive through the Rocky Mountains in western Colorado. That’s when I knew I had to go back…and I did!